In an effort to see more outside of Manhattan and Brooklyn, two weekends ago Nick and I took a train upstate to the picturesque town of Cold Spring. Luckily for us the sun was shining and our trip just so happened to coincide with the magnificent, yearly, changing leaves. The one hour and fifteen minute train journey out of Manhattan’s Grand Central Terminal, was wonderfully scenic. From the left-hand side of the carriage we were presented with incredible views of the Hudson River and the Palisades – a line of steep cliffs along the west side of the Hudson River. After crossing over into The Bronx and passing through Yonkers, both Nick and I were amazed at how quickly the transition from built-up city to quaint village was. It was literally like, goodbye big city… Hello small town USA! Then as we pulled into Cold Spring station a charming town greeted us. A town with wide tree lined streets, cute cafés, welcoming locals, and to top it off a jazz band playing under the village gazebo. From one quick glance Nick and I could see why Cold Spring was such a popular weekend destination for New York City dwellers. Cold Spring offers an idyllic break from ‘the big smoke’ and a much-needed change of pace from the constant rush that city life demands. Cold Spring, which is nestled between rolling hills on the shores of the Hudson River, is small-town America down to a tee. 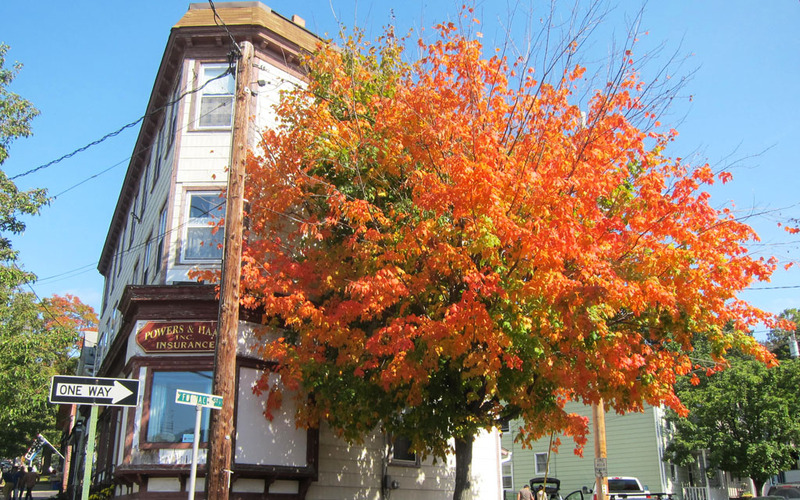 It’s quaint, laid-back, and retains a beautiful, well preserved historic district – and by district I mean street. Yet despite its modest scale, Cold Spring’s leafy Main Street, which dates back to the 1800s is one of the main draw cards for visitors. 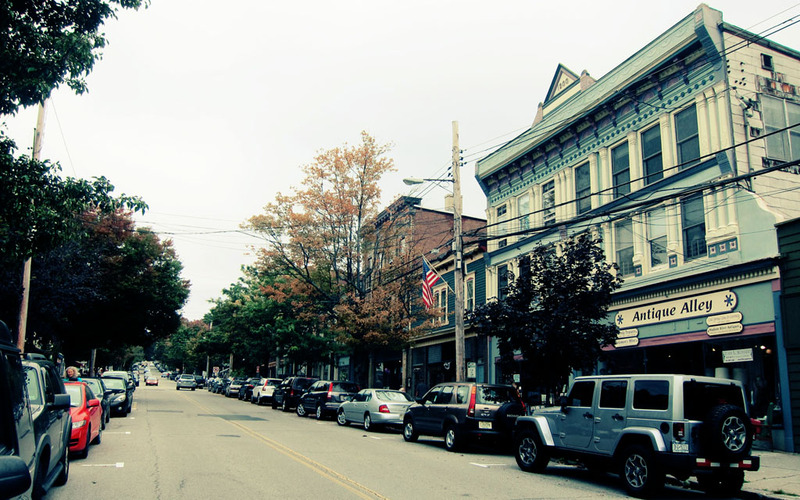 Indeed people come from near and far to admire the gorgeous 19th century buildings that run along Cold Spring’s historic stretch of road and, which today house a colourful collection of antique shops, coffee houses and a handful of independent retailers. Nick and I leisurely browsed and pottered our way along Main Street’s line of stores and boutiques. Being holiday season most of the shop fronts we passed were draped with all sorts of holiday decorations: beautiful autumn wreaths, strung up leaves, Halloween creatures, jack-o-lanterns and much more. We perused till we found an empty table out the front of a sidewalk café. There we sat, sipping away on our warming drinks, taking in all the lovely surroundings. A positively delightful way to spend a Saturday morning! Just as delightful if not more so was our stroll along some of the more quieter, residential side streets. Rows of turn-of-the-century houses, each with their own beautiful lawn and garden, neatly standing next to one another. As we wandered around we were surprised to be asked by a number of local residents, if we were lost or needed help. Obviously not many passers by venture out to these parts. Aside from the visitors who stroll along Main Street, a lot of out of town folk head straight for the surrounding valleys, where several marked walking trails, allow for both pleasant strolls and rigorous hikes. Particularly at this time of year with the changing of the leaves, Cold Spring as a weekend destination is extremely popular among walkers and nature lovers. 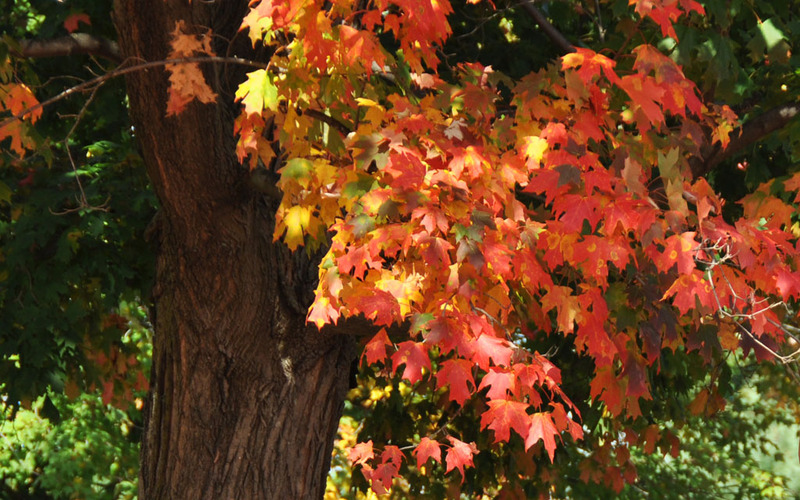 Fortunately for us, the trees of Cold Spring in all their autumn-time glory were ablaze with fiery reds, burnt oranges and mellow yellows. 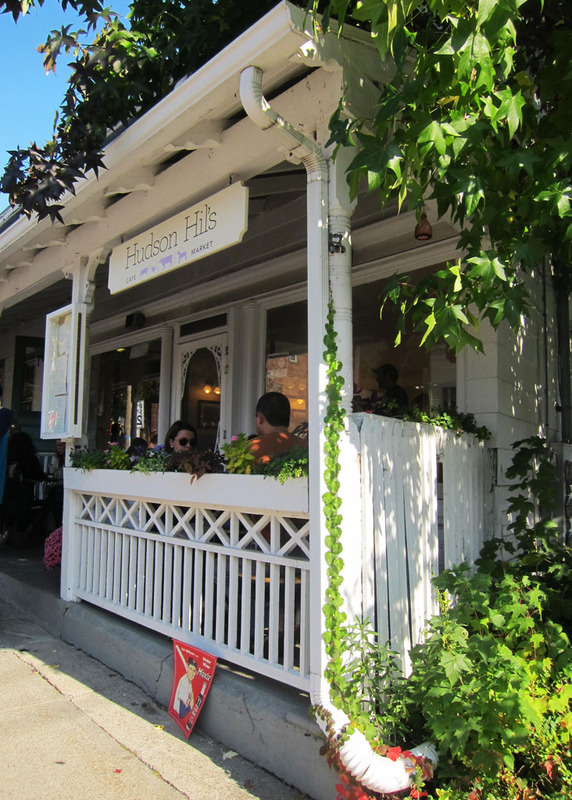 Having worked up an appetite, Nick and I headed over to Hudson Hil’s Café and Market, located on Main Street for a relaxed meal. The café is a popular place with both out of town visitors and the local weekend brunch crowd. 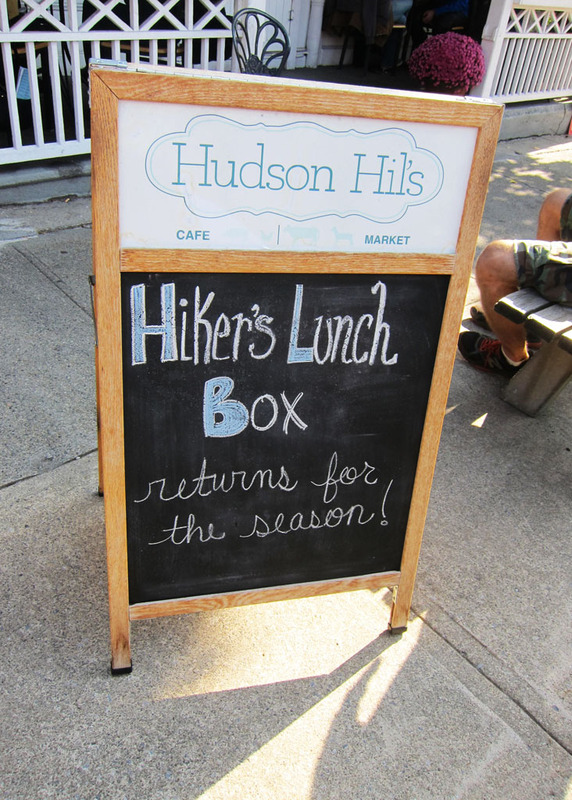 Serving a full breakfast and lunch menu as well as using only locally sourced ingredients from Hudson Valley farms, it’s no wonder why, really. As we toddled back toward the station, bellies full, all I kept thinking about – apart from the incredible home-made blueberry and raspberry pie I had just devoured – was how Cold Spring, rustic and laid-back in nature, couldn’t have been more different in atmosphere from New York City. It really is hard to believe that it is only an hour away, as it felt like we couldn’t have been further away. I definitely recommend a day trip or a weekend stay in Cold Spring. Believe me, the small town feel of the village will be a welcome change from the big city and you’ll leave as we did, wondering why you had left it so long to visit. From Grand Central Terminal take the Metro North Railroad - Hudson line to Cold Spring Station. An adult ticket one way costs $13. A popular weekend brunch spot with locals and visitors alike.